Can Watercolor Painting Improve my Oil Painting Skills? So I’ve been doing a lot more watercolor painting these days. I find it a beautiful medium that is very difficult but I really want to master it. With a few exceptions, I’m less than thrilled with the results I’m getting but I recognize that it really takes practice. Watercolor is beholden to the laws of physics in how water behaves. You have to learn to manage it, but you can’t really expect to fully control it. It also requires a different technique because it is transparent, so you can’t paint lighter colors over dark and expect them to cover the dark up. If you want white, you have to leave the paper white. You can protect the areas you want to keep white with masking fluid, but that’s is a skill that requires practice, just like everything else. 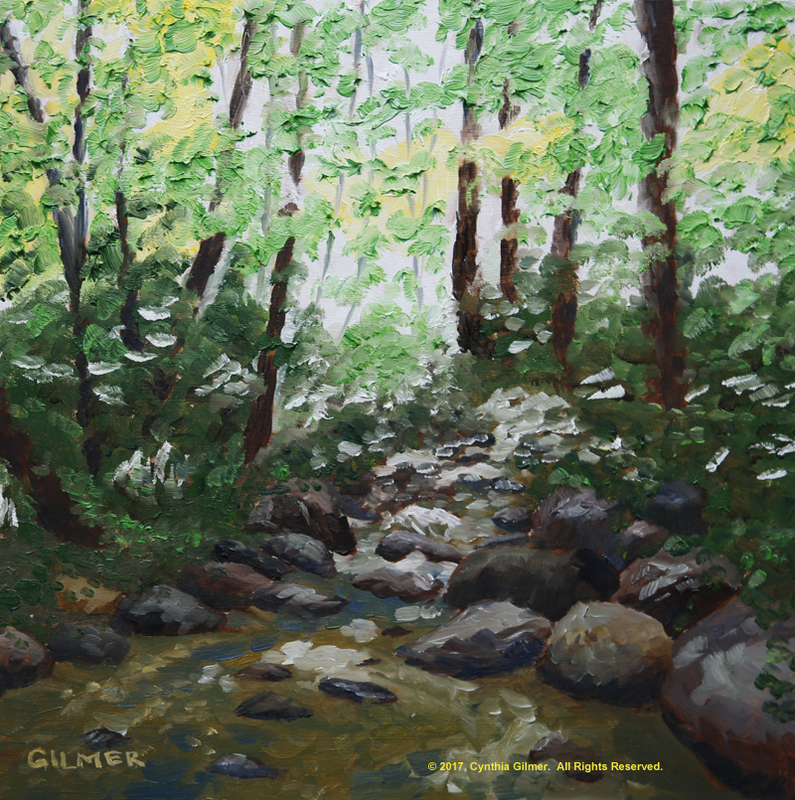 A few weeks back I set out to paint from a photo of one of our mountain streams. 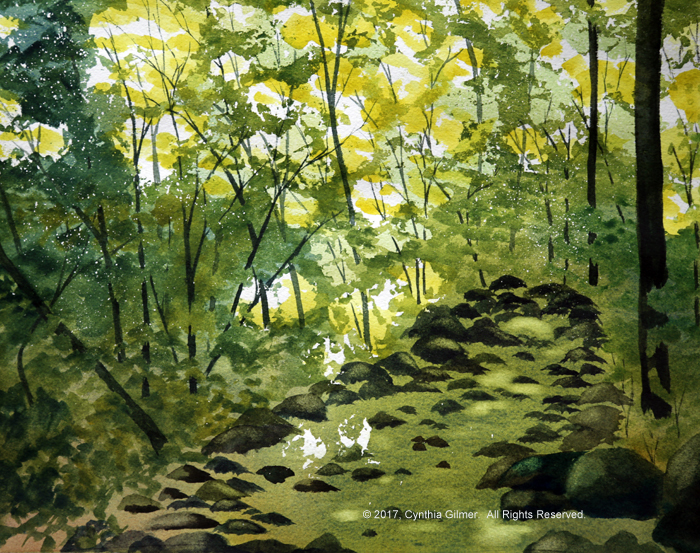 It was a really pretty scene where the light was dancing through the leaves onto the forest floor and the rocks and water. I had also just watched a video on pouring watercolors by an artist named Leslie Redhead. While I recognized I am not ready to try pouring, I did learn a lot about mixing color on the paper and doing repeated washes to get deep rich colors. 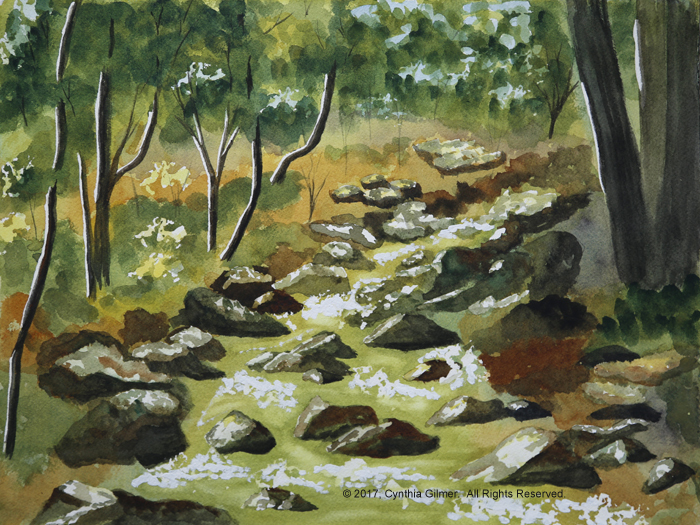 I used some masking fluid to mask out white areas where the sun was coming through the leaves and some of the light on the tree trunks. I ended up liking the deep washes, but not really the masked areas. They looked too contrived. I tried to fix this by adding some light colors (yellow and blue) but this didn’t really fix the problem. I also ended up embellishing some of the light on the water with white ink. The result was a good practice painting but nothing to write home about. Then I set out to try it again. I changed the masking technique to do some spatter. In both cases I applied the larger areas with a sponge, which in hindsight was probably part of the problem. In this painting, I like the sunlight in the background more than the previous version. I left it white but painted in the light yellow leaves to make it look less contrived. I did not like the effect of the light on the water. The shape of the sponge was not correct for water flow. I also didn’t leave enough areas white on the water, and lifting did not work. I did not resort to white ink to add more as I did in the previous painting. Once again, I ended up with a good practice painting, but nothing more. I really like the foliage and the tree trunks. I hate the water because it is too flat and does not show movement. Because I am impatient, I have a hard time leaving a watercolor painting alone while my layers are drying. I need to find other things to occupy my time so while I was painting my second study I started doodling a version of the same scene on a small piece of paper. I didn’t use masking fluid. I did some wet-in-wet, but didn’t so a lot of broad washes. In some ways I like this one the best of the three watercolors. So what does this have to do with oil painting and the title of this post, you ask? Good question! While I was doing these paintings I became very attached to the scene. I was also missing my oils. While they are a greater time commitment and more difficult to set up and clean up I still know my oil painting skills are better than my nascent watercolor skills. I decided to do a version of the painting in oils. I also committed to use two things I’d learned from my watercolor studies. First, I learned a lot about the scene and the way to capture the light. Second, I decided to try something a little different. I decided to approach the painting more like I do a watercolor painting. I primed the canvas in a light orange acrylic and then began by panting the white and yellow areas peeking through the trees. Normally I would paint the tree trunks before the foliage and would then paint leaves over the trunks. Of course you can’t do that in watercolor since the trunks are darker. You have to paint the trunks later, only in the areas where the foliage doesn’t cover them. I used this same approach in the oil painting. I painted the light leaves, followed by the darker leaves. 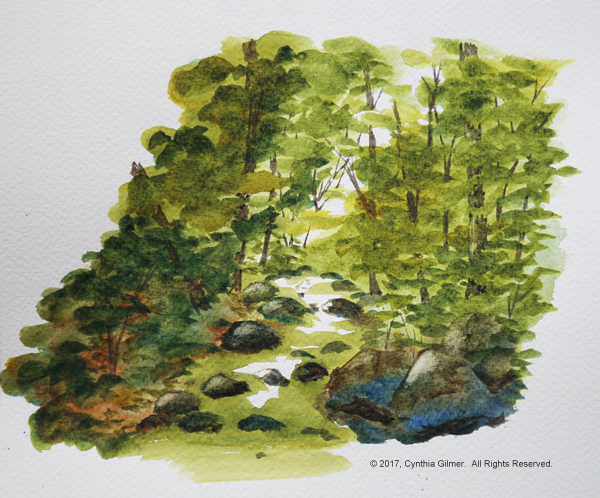 I painted the rocks and the water and captured areas of the bare forest floor between the leaves. The last thing that I painted was the tree trunks. The resulting painting was probably the most impressionistic thing I’ve done. I think it really captures the dancing light and the peaceful dark areas of the forest while not focusing on realism. I really like the result, especially if you step back from it a few feet, not something a photograph really allows for. So yes, what I am learning from watercolor does have the potential to improve my oil painting. I’m going to keep at it, and maybe someday I’ll be a good watercolorist too.